There are tons of gold facial masks on the market that has antibacterial properties and stimulates collagen production in the skin. As I was shopping, I saw a Korean “Ps… Golden Galaxy Peel of Mask” product that not only delivers the same benefits but also contains vitamin c, ginseng, and bergamot. Vitamin C is great for the skin! It will give you a more firm and plumped appearance. It also decreases wrinkles or fine-lines resulting in younger-looking skin. Vitamin C’s antioxidant properties also fade dark spots, repair and replace damaged skin cells. This ingredient should be the main focus of those who suffer from hyperpigmentation or melasma. Ginseng is also very beneficial to the skin. It is known as an anti-aging ingredient because of the phytonutrients which help tone and brighten skin. Another powerful component to this face mask is bergamot. Bergamot is a hybrid citrus between a lemon and an orange. Furthermore, because of it’s antiseptic and antibiotic properties it can easily remove bacteria from the skin. Vitamin C, Ginseng and Bergamot are key ingredients for clearing unwanted acne scars, discoloration, and blemishes. 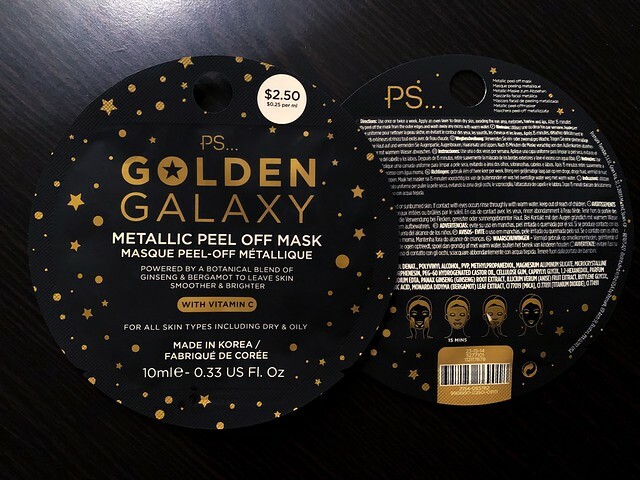 You can buy “PS… Golden Galaxy Metallic Peel Off Mask” at Primark for just $2.50 USD! Another great similar product is “First Botany Cosmeceuticals Cleopatra Gold Series 24 K Gold Mask” 8.8 oz /250 g which is for $18. For additional information on products that diminish dark spots you can read “My Hyperpigmentation Facial Night Routine” and for more Korean face masks check out, “Papa Recipe Bombee Fruitables“. This particular beauty line offers solutions for redness, bad acne, loose/saggy, sensitive skin and more! When and how do I apply the face mask? After removing my makeup, I apply a decent layer to the face avoiding the eyes, eyebrows and mouth area. The consistency of this product is very thick and can be messy so be careful. I leave the mask on my face for 15 minutes and gently peel. Once the mask is completely off my face, I wash away any excess using warm water. 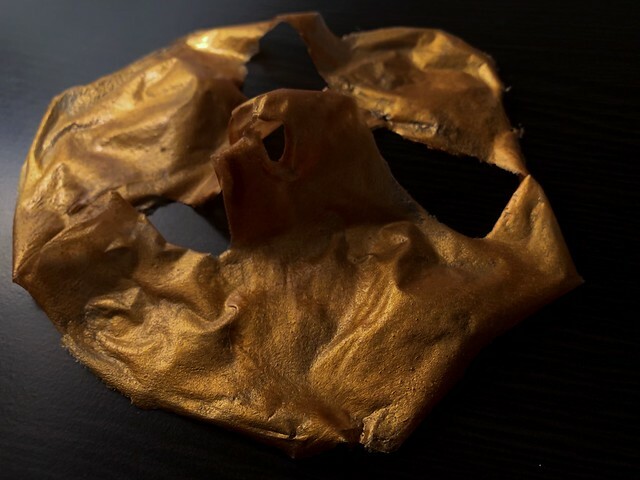 Below is a pic of “Ps… Golden Galaxy Metallic Peel Off Mask”, once dried and peeled from the face. I realized after this treatment my face was not only smooth but firm. I was pleased with the results and continued the process by applying my night cream and finished with a mist of rose water on my face. This product is worth trying!